New Pharmacy Construction | Sarnia | Carosyl Home Additions Inc.
A good pharmacy should be focused on the services it provides. Sarnia residents in search of a pharmacy are looking for answers to their health and wellness questions in the form of good service and good products. At Carosyl Home Additions Inc. we believe representing your pharmacy properly begins right at the beginning of the construction phase. As commercial contractors, we know how to follow Sarnia bylaws and guidelines, and as specialists in pharmacy construction specifically, we know what aspects make a pharmacy functional and attractive. Put your business future in the hands of experienced local contractors. Put your future in the hands of Carosyl Home Additions Inc. While some of your future clients may be in perfect health, many others will not. The nature of a pharmacy is to help people with a wide range of ailments. Because of this, our commercial construction team takes this into consideration during the design and build process. Your pharmacy design will include wheelchair ramps, adequate aisle sizes that everyone can access, and clear signage. Carosyl Home Additions Inc. knows the importance of a welcoming atmosphere and accessible floor layout that will ensure your clients are always happy to visit your pharmacy. Pharmacy construction is not like every other commercial construction project. To embark on a construction plan that will leave you and your clients satisfied, you need reliable and experienced commercial contractors on your side. Carosyl Home Additions Inc. has been a leader in the Sarnia construction industry for nearly 40 years. Our team is fully licensed, bonded, and insured—and are accredited by the Better Business Bureau with an A+ rating. We keep our pricing competitive and our quality high, because customer satisfaction is our top priority on every job. It all starts with a free service estimate. From there, you’ll experience a customized approach to construction planning that takes all of your thoughts and concerns into consideration. 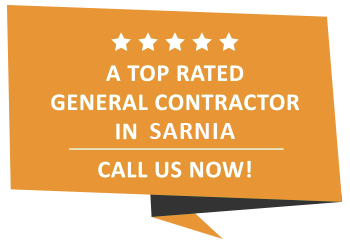 Carosyl Home Additions Inc. takes pride in serving our Sarnia clients to the standard they deserve. The Carosyl Home Additions Inc. commercial contractors may have extensive experience in swinging a hammer, but we also are focused on design. We believe that pharmacy construction requires an extra level of attention, and having built many successful pharmacies over the years, we know we are the team to achieve exactly what you’re dreaming of. A Carosyl Home Additions Inc. pharmacy is a successful pharmacy, and together, we can make yours the next on our list of successful builds. Our dedicated team is waiting to hear from you! Carosyl Home Additions Inc. has been serving Sarnia business owners and contractors since 1981, and we’re not about to stop any time soon. We believe in creating superior construction plans, using our reliable team and if necessary, tried-and-true subcontractors that you can trust. Pharmacies provide an important service, and we’re proud to help start your business journey off on the right foot. Give us a call or send us an email today to get started! All information provided is provided for information purposes only and does not constitute a legal contract between Carosyl Home Additions Inc. and any person or entity unless otherwise specified. Information is subject to change without prior notice. Although every reasonable effort is made to present current and accurate information, LinkNow!™ Media makes no guarantees of any kind.